How I got to this particular journey… | My Journeys Through Life . . . Herding Cats In New Mexico! Join the crowd and link up by clicking below for instructions! All of my adult life, I’ve battled with weight/food issues. I’ve lost weight, lots and lots of it, but never enough, and never for very long. Then, four years ago in May, I was in Karmanos cancer facility (in Detroit, MI) having a total hysterectomy as the result of being diagnosed with endometrial cancer. The surgeon told me then that if I didn’t lose the excess weight, my cancer would most likely come back, and that I had to do it even if it meant bariatric treatment. Well, I did try. I lost about 30 pounds, and then gained it all back, plus more. As usual. I know exactly what it feels like to lose a little weight, then gain it back and more. I’ve struggled for years. Find something that works, lose weight, feel great, gain back and not be able to lose it the same way again. I had lost quite a bit before getting pregnant with our now 3 year old. Since his birth however, I have just been dropping 10-20 pounds and gaining it right back. It can be so discouraging. I’m curious how the surgery went for you. Praying you can stay away from that soda and work on losing the weight again. 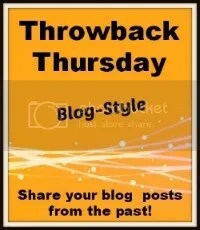 Thanks for sharing with Throwback Thursday Blog-Style.